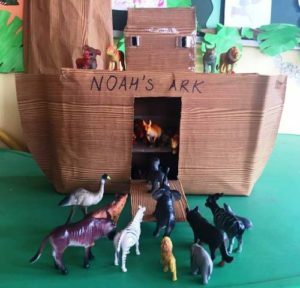 The Theme of the month being “Wild Animals”, and our related Activity in the third week was Noah’s Ark. Here, the kids were supposed to speak about their favorite wild animal. I decided to make a miniature of the ark for my kids in the classroom. I took a shoebox, with the lid pasted on it. Then placing it on one side, cut out the door as shown in the pic below. 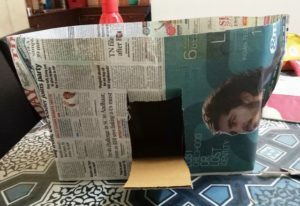 Further, I covered it with 2 pieces of newspaper and stapled them on the sides (see pic). Then I pasted the woodgrain printed paper over the newspaper. Also, to make it look like a ship, I added a small hut with windows cut out on the top of the box. Lastly, I “embellished” it with Wild animals. 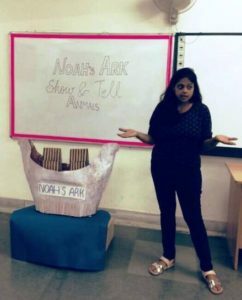 It stayed in our class for full month and we heard the story of Noah’s Ark almost everyday for a month. We had a big ship (made by one of the teachers) in our activity room. This we used on the Activity day as the backdrop. I narrated the story to the kids. Then all the kids spoke about their favorite wild animals one by one. 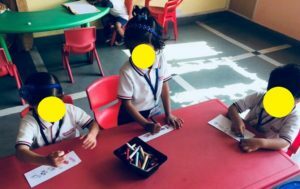 Finally, we did a small craft in our class in the scrapbooks. 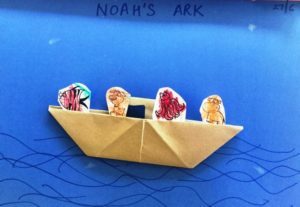 I made some paper boats from simple brown paper for each kid. Then I got printouts of mini animals and gave each kid a strip of 5 animals to color. I cut them out for each kid. Then we pasted the boat in the scrap book. 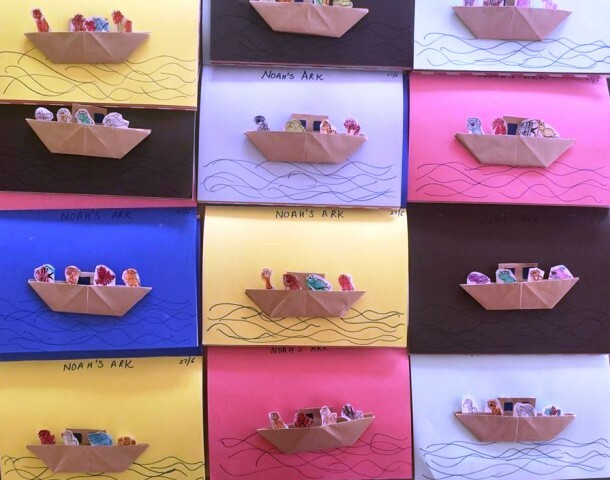 Next we pasted the colored animals inside the boat. Finally they made some water with a blue sketch pen.